Introducing “TORPEDO LAUNCH” the first skill-based Submarine Arcade Game on the Tron(TRX) blockchain powered by the HDX20 Token. Come and play against other players, show the world that you deserve to be a winner and collect Tron(TRX) Prizes. The Campaign will start after at least 1 player has played and submitted a score to the leaderboard then, for every new highscore registered, a 24H countdown will reset. At the end of the countdown, the 8 best players ranked on the leaderboard will share the Treasure proportionally to their scores and everybody will receive their prizes. Every time you buy new torpedoes, 5% of the price will buy you HDX20 Token, which you can resell anytime, earning you Tron(TRX) from the volume of any HDX20 POWERED GAMES (visit trx.hdx20.io for details) while 20% of the price will buy you new shares of the game. Please remember, at every new buy, the price of the share is increasing a little and so will be the value of your shares even if you are not a winner, therefore, buying shares at the beginning of the campaign is highly advised. You can withdraw any owned amount at all time during the game and play multiple times to improve your score. ‘We are a gaming and entertainment network our blockChain launch product is HDX20. 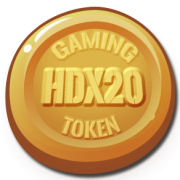 HDX20 tokens can be bought & sold on our exchange and are distributed every time someone is playing an HDX20 POWERED GAME. With 4% IN and 4% OUT fee only, the price of the HDX20 can only go up by design, cannot be dumped on holders and is fueled by both the volume of transactions and HDX20 POWERED GAMES. We have designed a vault where your HDX20 value while still indexed on the Tron(TRX) Price will appreciate automatically over time. https://hdx20.hdx20.io/wp-content/uploads/2019/04/tron-logo.jpg 500 500 hdx20 https://hdx20.hdx20.io/wp-content/uploads/2019/03/hdx20token-1-180x180.png hdx202019-01-07 15:29:072019-04-10 15:30:24INTRODUCING "TORPEDO LAUNCH" the first skill-based Submarine Arcade Game on the Tron(TRX) Blockchain !